I recently had the opportunity to meet with Michele Crowl, executive director of Discovery Space, at the children's science museum's location at 1224 N. Atherton Street, right across from TGI Fridays. Locals may know it as the site of the old Commercial Printing but it has also been a furniture store and most recently a church. Discovery Space took it over in 2017 and, moving from its smaller downtown location on Foster Avenue, has expanded its services and programs with the expansion of their square footage. The programs and services they offer are pretty incredible. With more than 45 hands-on and “please touch” exhibits, young and old learners alike can roam around at their own pace or they can participate in a variety of structured programs. The exhibits address learning objectives through experimentation and play. Picture a car dealer showroom-size room (the building was originally built as a car dealership) with stand-up and sit-down science focused exhibits where kids are encouraged to touch and to try. I was really impressed. The history of Discovery Space is one of community engagement. With roots in the Downtown Improvement District, a group of locals pulled the money together, set up the 501c(3) non-profit status and started looking for space. The idea was to develop a draw to downtown that attracted families with kids and that offered a learning opportunity. With collaboration from a variety of departments at Penn State as well as local businesses, Discovery Space had its grand opening in October of 2011. I remember reading about it at the time and questioning if our local demographics could support a children’s museum. I am happy to say they have proven me wrong. Visitors last year include the “regulars” coming from the Centre Region but also from seven surrounding counties as well as those passing through who are in town for other opportunities like sports camps or the Central PA Festival of the Arts. 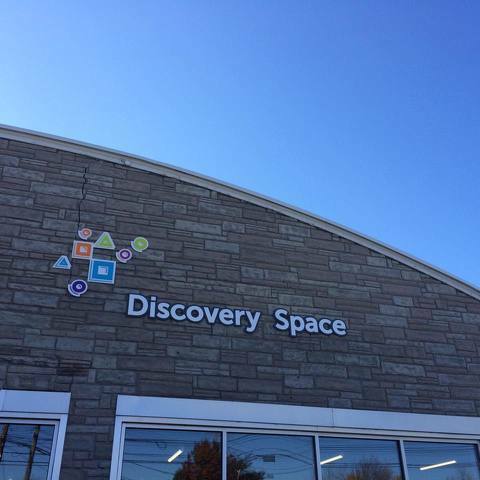 Michele shared that since the Discovery Space of State College moved to their new location, the number of annual family memberships has jumped from about 800 to almost 1,400 family memberships. The entrance fees are extremely reasonable. To just pop in, it’s $7 per person (children under 2 are free). Groups of 10 or more (with advance notice) drop down to $5 per person. A basic family membership is $90 per year but includes 2 adults, children and discounts on parties and programs. There are more elaborate family membership packages as well as corporate memberships and sponsorships available. Considering the cost of a kid’s ticket at the movies these days is around $10, engaged learning and activity for $7 seems like a pretty good deal. Additionally, Discovery Space offers “passes” that can be checked out through Schlow Library. They welcome any and all. Michele mentioned that school groups, daycares and other special groups make up a big chunk of those annual visits. They hold birthday parties and operate camps all summer and over school breaks. There is a regular calendar of structured classes and special events. Michele indicated that there is a mission in particular to encourage boys — and girls — to come and learn and play where the focus is STEM – science, technology, engineering and math. The facility itself is really cool. In addition to the exploration room, there is a very large enclosed space with a kitchen where they hold summer camps and – if you can believe it - toddler programs. I was there on a day that was closed to the public so I got to see the behind-the-scenes staff area where, in addition to the work space of their teachers and assistants, rows of shelving were stacked with craft and science and art supplies. There were some new “exhibits in progress” as the staff works to maintain a fresh and new feel to the learning experience and to encourage repeat visitors. They recently revamped their gift shop so visitors can take home games, activities and even jewelry with a focus on STEM. Michele was excited about expanding adult opportunities as well. Discovery Space currently sponsors “Science Pub” for adults off-site in which a guest speaker on a science related topic is brought in to discuss his or her area of expertise. Science Pub takes place at Big Spring Spirits in Bellefonte on the first Wednesday of every month. The current landlords are considering renting out the garage-like space in the back of the facility and Michele and her team have some ideas. They would love to see a “workshop” for adults to be able to work on projects like welding, or other trades that could support learning, creativity and perhaps employment training. It truly is a Discovery Space. If you missed their annual Night to Discovery fundraising dinner held last month at the Penn Stater, the Chamber of Business and Industry of Centre County (CBICC) is holding their monthly “Business After Hours” program there from 5:30-7:30 p.m. on Thursday. As a non-profit, fundraising is always a concern so that they can keep the fees affordable. I would encourage young and old to check out and support this amazing community asset. The construction on North Atherton St. makes it a little tricky to get in right now so guests are encouraged to use the entrance off Cherry Lane. Discover the Discovery Space of State College. You might learn something while having some fun. 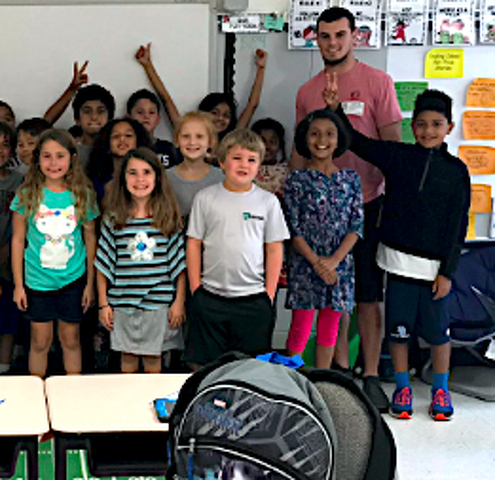 In the DMV, hitting classrooms, spreading the Penn State message, talking to future Nittany Lions.